Charlie Brightman is young, talented, self-confident, well-dressed (very well-dressed), and a bit of a drip. His first attempt at a theatre job is with the rather seedy Dengate Theatre in Soho, where a cast of dubious characters ensnares him into helping with an improv show which descends into chaos. He does, however, meet Lilly, a candidate for the position of his girlfriend. While pursuing this woman of his dreams, Charlie is hampered by the unexpected cancellation of his acting scholarship, resulting in a complete lack of funds. He takes on a job in the country, helping the redoubtable Hattie Witherspoon run a ‘literary dramatic festival’. Hattie assumes a position of importance in Charlie’s affections after a night involving gin and a bathtub. The story follows his attempts to win Hattie’s heart and the adulation of London theatre-going audiences — or at least a paying job — in an ever-increasing maelstrom of bad luck and bad parts. But he remains confident that it will all be all right in the end. 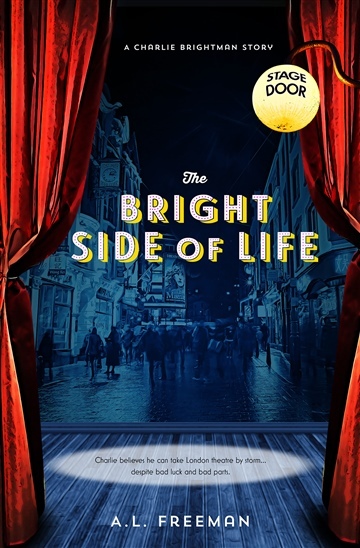 This picaresque story lurches from highs to lows to highs again, examining the curious question of whether it’s really a wise policy to continually look on the bright side of life. Annette Freeman is a born and bred Tasmanian. She was educated on the island and at the Australian National University in Canberra, where she completed degrees in English Literature and Law. Although there is a lot of creative satisfaction in literature there is not much money to be made, so the law was where her vocation took her. Having subsequently spent thirty years of her life as a high-powered corporate lawyer, whizzing about the globe and transacting business for multinationals, Annette now sees less of her office, and continues to travel as often as possible. She has more time for writing, musing, studying philosophy and history, and adventure trekking.